Chelsea Peretti aka Gina Linetti has shared that she won't be a series regular on the upcoming sixth season of Brooklyn Nine-Nine on NBC. Since the show is currently filming it's likely she'll appear in the first couple of episodes before departing the comedy somewhere during the 18-episode season. Chelsea Peretti here. I want to thank you all for the hours you spent watching Gina be Gina. But that doesn’t mean I won’t ever be back a guest return isn’t out of the question. This happened because the fans of the show went berzerk. NBC’s pickup of Brooklyn Nine-Nine follows 32 hours of groundswell of support for the show on social media the magnitude of which we have rarely seen, with regular fans — joined by celebrity ones like Lin-Manuel Miranda, Guillermo del Toro, Seth Meyers and Mark Hamill — rallying behind it. Acknowledging the big role fans’ social media campaign played in the show’s resurrection, Brooklyn Nine-Nine‘s creators and stars announced the NBC pickup directly to them on Twitter. Word is out this afternoon that Fox has cancelled Brooklyn Nine-Nine after five seasons. The sad news comes with two episodes remaining until the comedy's now-series finale, which is scheduled to air on Sunday, May 20. The half-hour series, which stars Saturday Night Live alum Andy Samberg, has been a decent performer for the network over the course of its run, though slipping ratings in recent seasons has seen it perennially on-the-bubble come renewal time. Brooklyn Nine-Nine follows an offbeat group of detectives and staff at the 99th precinct of the New York Police Department. The eclectic squad is led by Jake Peralta, a talented but immature detective whose carefree style clashes with his stern, by-the-books captain. The show recently surpassed the 100-episode milestone and was the network's second-longest-running live-action comedy. It also won numerous awards over the years, including two Golden Globes in 2014. Fox announced today that Brooklyn Nine-Nine has been renewed for a fourth season. The award-winning comedy, which stars SNL alum Andy Samberg, has been a decent performer for the network in its Tuesday night time slot. Desperate Desperate Housewives alum Eva Longoria has been tapped for a three-episode arc on the upcoming second season of Fox comedy series Brooklyn Nine-Nine. Longoria will play Sophia, a defense attorney who catches Jake’s (Andy Samberg) attention when she faces off against him in court. FOX announced today that Brooklyn Nine-Nine will live to see another season, which will mean the show is going into it's second season. "This show is one of the best and acclaimed series on television, with influential, culture-driving stars, and some of the best, most creative talent behind the camera and we are happy to bring it back to FOX fans for another season," FOX bosses Kevin Reilly and Joe Earley said in a joint statement. Brooklyn Nine-Nine will be introducing the husband of Andre Braugher’s veteran cop in early 2014, and he will be played by actor-comedian Marc Evan Jackson. The 99th precinct will meet the mysterious Kevin when he invites them to Holt’s birthday party at their home. Fox’s rookie comedy, which last week snagged two major Golden Globe nominations, returns from its holiday hiatus on Tuesday, January 7th 2014. The former Saturday Night Live star is set to return to Fox’s Brooklyn Nine-Nine, marking his first appearance on the show since his buzzy cameo in the pilot. And he’s not just in any episode, but landing in the comedy’s huge post-Super Bowl slot. Armisen will reprise his role as “Melipnos,” his oddball character from the premiere. Amy (Melissa Fumero) and Jake (Andy Samberg) have another strange encounter with Melipnos while tracking down a suspect. 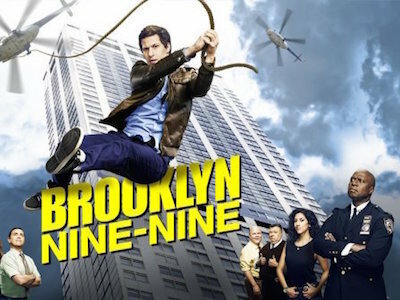 Despite okay at best ratings, FOX has elected to grant freshman comedy 'Brooklyn Nine-Nine' a full 22 episode season. In addition to ordering the show's back-nine episodes, the network also plans to put the show in the coveted post-Super Bowl timeslot. Patton Oswalt will make a guest star appearance on 'Brooklyn Nine-Nine' this season. He will play Fire Marshall Boone, a character who has had previous conflicts with Det. Jake Peralta (Andy Samberg). Peralta runs into Boone while on scene investigating a suspicious fire. FOX has decided to pick up "Brooklyn Nine-Nine" to series. The series will begin to air during the 2013-2014 season.